This isn't an abandoned station; it's just had a lot of work carried out on it: the station building was replaced and the lifts shafts were replaced by two flights of escalators (the longer of the two currently holds the record for being the longest in Western Europe). A sub-surface concourse was built in such a way as to allow access to a new line, should one ever be built (the line in question being the Hackney-Chelsea line, or at least one of its proposed routes). Angel (Northern Line) - 1979 or so. This narrow island arrangement is still in evidence at Clapham North and Clapham Common. Move your mouse over the image to see the same view in Dec 2008. The northbound platform was moved further away to allow more platform room and to allow a concourse for the new escalators. 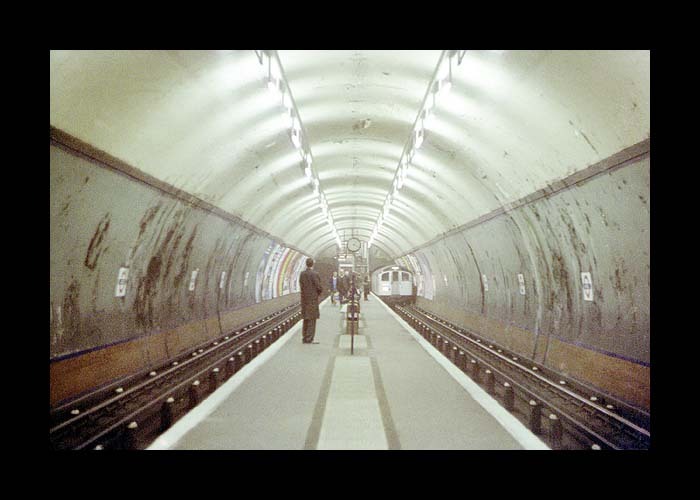 Similar works were carried out on the City Branch at Euston in the 1960's for the arrival of the Victoria Line and at London Bridge for the Jubilee Line extension. The disused section of the northbound tunnel, north of the station. The new northbound track rejoining the old alignment north of the station. The stairs leading to/from the lift shaft that were removed after the new escalators were brought into service. Disused passageway leading to the old lift shaft. The old station building interior in 2005. The old station building in 2001 with some peculiar extras bolted on the front.